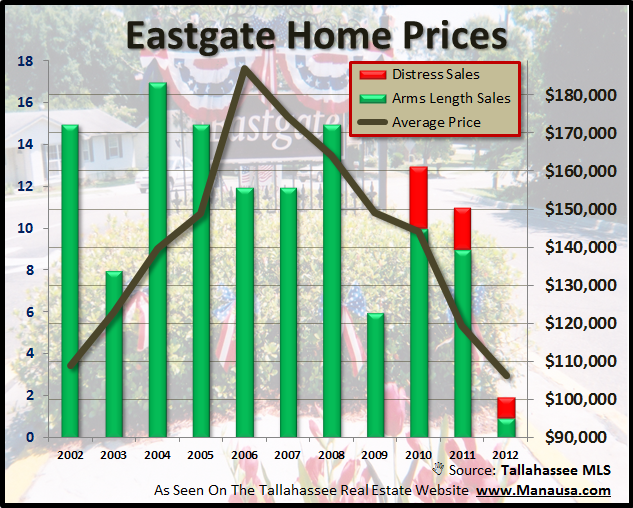 Eastgate is a very popular NE Tallahassee Neighborhood with homes that sell just below the median home price point in Tallahassee. Located just south of I-10 on Capital Circle NE, Eastgate offers super convenience and excellent home values. Currently, there are 5 homes for sale in Eastgate, ranging in price from $139,900 to $153,500, and last year there were 11 homes sold, meaning there is less than 6 months of supply of homes on the market in Eastgate. 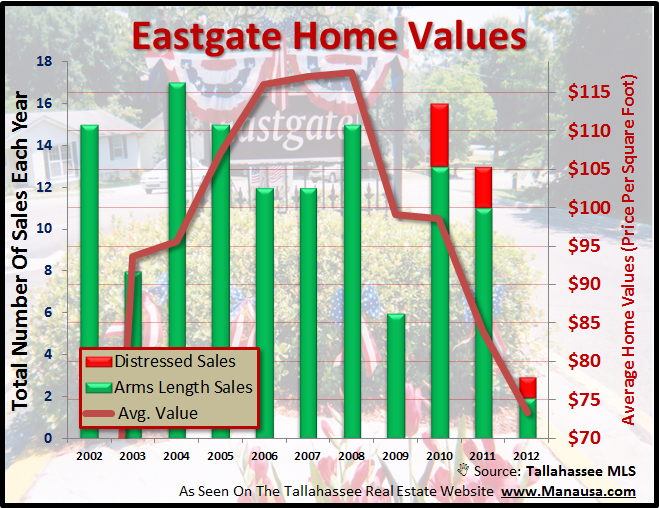 Eastgate home prices are down nearly 40%, but this year's numbers appear to be skewed by a higher than normal ratio of distressed properties compared to arms length home sales. As the year progresses, I would expect to see the average price move up near last year's $120,000 average. This means the asking prices that are currently seen in Eastgate are not likely to be realized. Home sellers are currently asking for 2010 values, but buyers have other options. Home values in Eastgate once averaged $118 per square foot at the peak of the housing market, but last year values dropped to $84 per square foot, and this year we've seen that reduced to $73 per square foot thus far. Some home sellers just don't get it. Currently, the asking values on the homes for sale in Eastgate range from $93 per square foot up to $121 per square foot. That's right, one seller is asking more than the property would have sold for at the peak of the market, several years ago. My advice to people who need to sell a home in Eastgate ... either price it to sell so that you get it sold fast (values are falling, right? 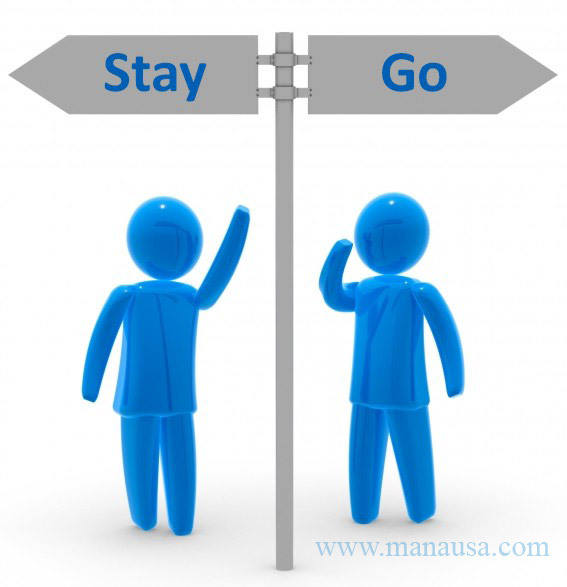 ), or take the home off the market to give buyers fewer choices. Buyers are not stupid. They are using property search tools and getting a good idea of value, so overpriced homes are being compared to nicer homes ... meaning they are not being chosen by buyers. Please come back again to find more Tallahassee neighborhood reports, including updates on Eastgate. "there is no longer a report from Florida Realtors that includes the state’s metropolitan statistical areas (MSA) data. Instead, the local Realtor associations are empowered to release their own local association data." I was wondering if you know whether or not there will be a local Tallahassee realtor association that will continue reporting local home sales and price data that is consistent with the methodology that the Florida Board used to report for Tallahassee. I like the data that you report, but I also always liked getting Tallahassee housing data from multiple sources. Thanks for your continued work covering the Tallahassee market. Hey TLH, not that I'm aware of. But I can tell you, they used information from our MLS for their reports, warts and all. My reports have removed the duplicates (some homes are sold or listed multiple times in our MLS). I will miss seeing how we compare with others though.